On Saturday afternoon I was invited to a table discussion. What I didn't expect was that I'd be building the table. The Arbeit Gallery, where I'd seen Christopher Matthews' performance piece the night before, commands an imperious view of the Hackney Wicked crowds. 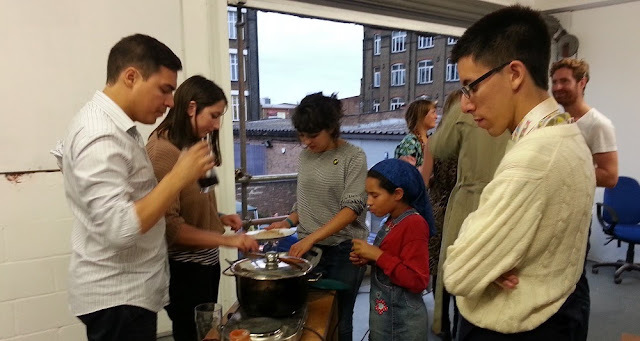 From their balcony you can look right down at the fashionable, young visitors to Hackney Wick guzzling roasted cassava and washing it down with a swig of coconut water. It's all very East London. But up here things are a bit more hands on. After a decent amount of attendees have arrived we all take our places around a shaky round table, made of rough, splintered planks and trestles. The first order of business is to get this thing nailed together. We're handed an electric drill, some planks and a few nails and told to get on with it. The guests are a mixture of artists (both visiting and residents of Hackney), writers, documentarians and organisers of various stripes. East London artists can be pretty high-falutin' at times but you can always rely on them to know their way around a bit of DIY, so this is good company to be in. We flip the table over and drill it together with screws right through the centre. Flip it back over and we've got ourselves a moderately stable surface. I look up to chat to someone, and when I look up, apparently from thin air an enormous crop of vegetables has been conjured. In the blink of an eye the table is transformed from bare wood into what looks like a primary school Harvest Festival. Chopping boards and plates are distributed and soon the room is filled with the clickety-clack of knives slicing through veg and hitting wood. It's all very communal and chatty in the room; though there's a hum of activity there's no-one shouting orders or telling anyone what to do. You just grab a bag of onions, get a knife and start chopping away. 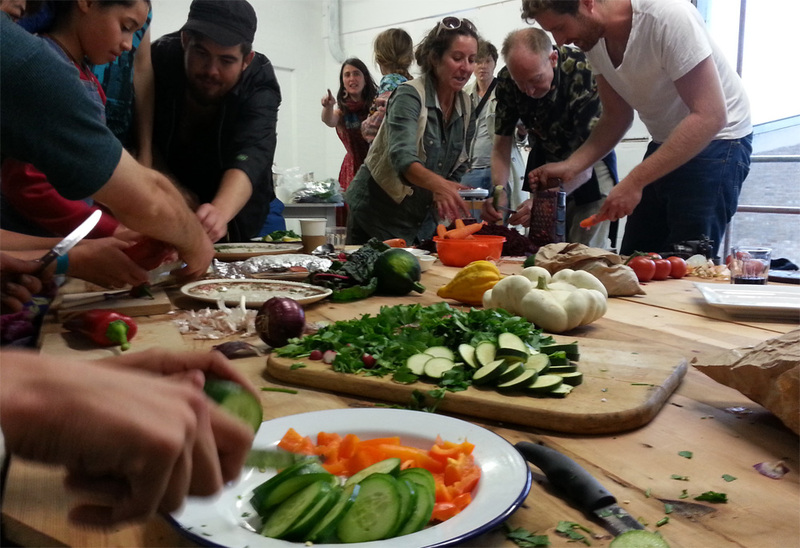 This process of chopping up the veg spurs everyone to get chatting, and soon I'm learning about herbal art projects in Deptford and film festivals in North Carolina. One of the benefits of heading to these things is that you rarely meet people who do deeply dull things - there's little chance of finding yourself in the kind of conversational dead zone that occurs when you ask someone "What do you do?" and they reply "I work in financial systems design." That conversation isn't going anywhere interesting. But if someone responds, "I'm running an intensive course exploring the nature of madness" then you're onto something! That person was Andre Verissimo. After we'd eaten a first course of salad he dimmed the lights, and began to explain his focus on exploring insanity through his art. To give us a taster of what he wanted to achieve, he asked us all to think of a sound we could make to convey madness. I decided to emit a strangled, squeaked, high-pitched sound - as if I was an abandoned kettle trapped at boiling point. With everyone making their own noises we walked around the room in darkness, the air full of manic giggles, screams, low desperate moans and sobbing. I think someone was even underneath the table grunting in fucked up passion. Sure beats awkwardly discussing the weather or blithely chatting about football results. The exercise reminded me of warm-up exercises from theatre classes, everyone getting a liberating license to behave really weirdly. It loosened everyone up, just in time for a main course of vegetable curry, rice and chapatis. The table then fell into conversation, chat beginning with the use of medication to control mental illness, then progressing to prescription drugs to treat behavioural issues in children. This then spawned a conversation about how modern media influences children. Unfortunately the debate, unlike the delicious food, was a bit undercooked. There was a rather wishy-washy anti-science bent to the whole thing, which morphed seamlessly into "but what about the children"isms. One part that particularly got my goat was a criticism of shot length in modern movies, with a mention of 'explosions per minute' with the implication that there's a concerted campaign to subtly brainwash children by destroying their attention spans. It's a rather facile way of looking at media, especially as Pixar, inarguably the most popular producer of children's cinema has a relatively sedate shot length. The whole thing was essentially the kind of argument that could have been put forward at any time since the 1950s - concerned parents complaining that Thunderbirds or Doctor Who or Powerpuff Girls is too fast-paced and is ruining their children. The key to remember is that media isn't necessarily getting faster, and if it is that isn't necessarily a bad thing. The problem is you. You're getting older and you've got work harder to keep up. The wider conversation aside, this was a great night. I realised pretty early on that symbology of the evening felt rather Christian. 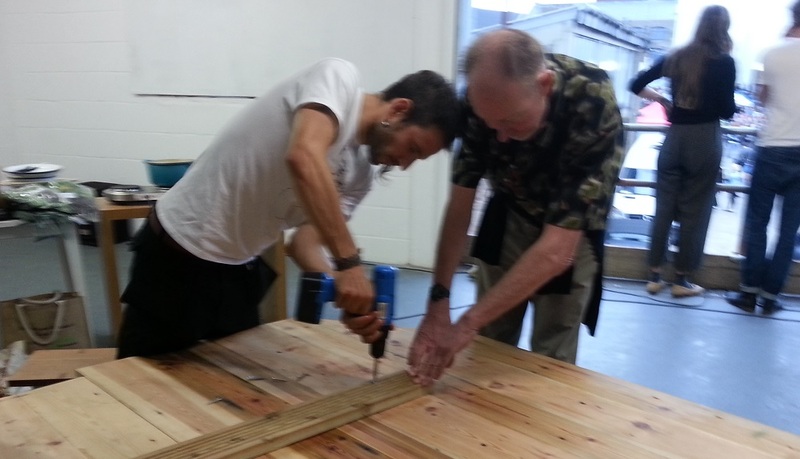 We began with carpentry, nailing together our own table, and proceeded to a communal 'feeding of the five thousand'. 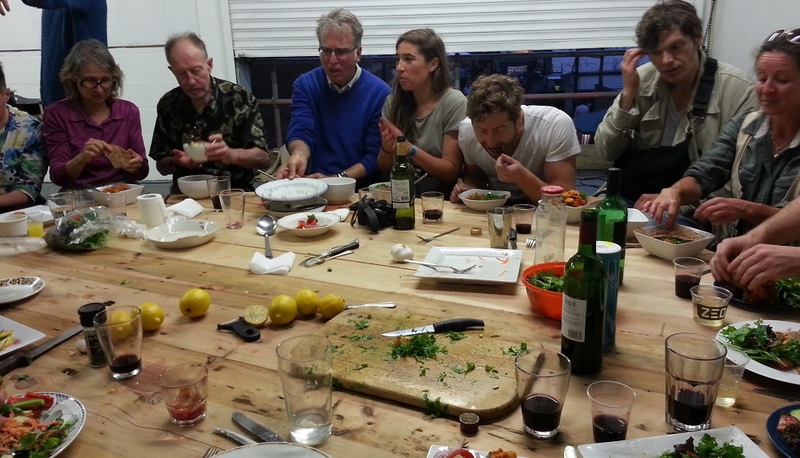 Cooking together creates an immediately tangible bond between the participants. What we prepare becomes digested by those around us, a circular process of friendship, the food in our bellies hopefully symbolising the knowledge we're taking with us. As we sat around the wooden table eating our bowls of food and drinking wine it felt rather like a kind of Last Supper, though admittedly nobody was due to be executed afterwards.. Thanks to Hajni Semsai for inviting me along, and thanks to everyone I met for such great food and interesting conversation.